Comments: Linda Listmann of Santa Cruz, CA, is transcribing her great grandfather's journals, which began in 1875. His name was John Jones. 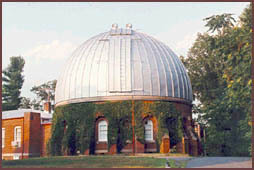 In the summer of 1882, John was one of two astronomers, who came with Ormond Stone from the Cincinnati Observatory to oversee the building of McCormick Observatory (shown at right) at the University of Virginia. Stone became director of the observatory, and John helped with the building and his mentor's astronomy work. According to his journals, John arrived in Charlottesville on a bicycle and took room and board at the Emersons' home. John secured his bike in Cinncinati and rode it much of the way from Cincinnati to Charlottesville. His bike was a 50-inch Columbia Standard bicycle, which he purchased for $90 from Pope Manufacturing of Boston. The high wheel 'bi' was introduced to Americans at the 1876 Centennial Exhibition in Philadelphia, and in just a few years, the contraption bowled along the streets of larger cities, although there were only two bikers in Albemarle County in 1883. The front wheel of the 'bi' was as large as a man's leg length would allow, and the larger the wheel, the farther a bicyclist could travel with one rotation of the pedals. Thus the rider sat high above the center of gravity with his legs trapped under the handlebars. If the front wheel was stopped by a stone in the road, or the sudden emergence of a dog, the entire apparatus rotated forward on its front axle, and the rider was dropped unceremoniously on his head. Thus the term 'taking a header' came into being. John was a devoted bike rider even though most Albemarle roads were rutted by wagon wheel traffic, and bike riding was bone jarring and dangerous. On one of John's jaunts right after he got his 'bi,' he went over the top and landed on his elbow, either breaking it or tearing the ligament. He often wrote in his journal that his knees were sore or that he tore his britches, but none of it kept him from riding. John wrote: "The bicycler may sometimes get hurt and in learning to ride runs the risk of getting a few bruises, just as the child in learning to walk is liable to get many a tumble before his limbs will carry him safely wherever he wishes to go, but this is not because of special danger in the machine, the danger is rather in the learner's want of knowledge, how to control it, and of confidence in himself for so doing. A dislocated limb or broken bone is not more liable to occur in bicycling than in scores of other things. Every one who runs, skates, plays ball, rides, even walks if he direct his steps along our plank ways when a little wet runs the risk of meeting with such an accident. Every man, who has sound limbs and a little youthful energy can learn the art of riding, but, although this is true, to become a bicycler requires a clear head, a firm hand and a steady nerve, combined with a keen eye, readiness for quick decisive action, and with the manly courage to triumph over every difficulty." In April 1883, John met Miss Nannie Harris of Scottsville, who came to stay with the Emersons and help out. Nannie was born in Scottsville in 1854, the daughter of Lafayette and Martha (Minor) Harris. When her husband died two years later, Martha Harris supported her three daughters, Etta, Nannie, and Florence, by running a millinery and dry goods shop. 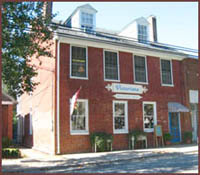 This shop was located in the building known today as 476 Valley Street (see photo at left), and the Harris women lived above the store. In 1876, Florence Harris married Rev. McCutcheon and moved to Waynesboro. Etta and Nannie remained single and helped their mother run her shop, which sold lace, material, corsets, and pretty hats. Monday Dec. 25, 1882: The day was bright and beautiful and for a winter day was quite pleasant. It was muddy as the sun thawed out the light freeze of last night. The snow that fell last week is about all melted. I put in most of the day at my room in reading and writing. Before dinner I took a little ramble over Lewis mountain. Miss Harris and Miss Emerson with the assistance of some of the boys decorated the dining room very nicely with evergreens and mottoes. The fan rack over the table was decorated with ivy, and had suspended from it an evergreen horse shoe, with "Good Luck" in the middle of it, on the north wall was, "A Merry Christmas," on the east "Long life and happiness." The pictures were decorated with ferns, and the tall clock, with ivy and mountain Laurel. We had a good dinner. Spent about an hour at the table and had a good time. Wrote a letter to Katie Paine. Sunday Jan. 14, 1883: Last night it turned warmer and rained a little. This morning shortly after sunrise it began to break away, and early in the forenoon it cleared off and the rest of the day it was beautiful. The sun shone out bright and warm, and the snow settled down a good deal before night. After sundown, it turned cold again and froze very hard during the night. This was my second Sunday for staying on the mountain. I went up at ten o'clock. Not a single one of the Prof.'s imaginary loafers put in his appearance during the day. He drove up with Mrs. Stone and Nannie after church. Nobody else was near the observing shanty all day. In the morning I ans'd Billy's letter, and in the evening I wrote to Miss Kittie Warner,Marietta, Ohio. Friday Apr. 13, 1883: During the greater part of the day it was damp and cloudy, but towards evening it began to clear off. Yesterday there was a pretty brisk April shower in the middle of the day, but it didn't last long and although it continued cloudy, the rest of the day it dried off pretty rapidly. Before dinner today I rode to town and found the road in pretty fair condition, and it was still better when I went down in the evening. I brought up from the hardware store (Jones's) a brace and five bits, and half dozen screws for the observatory, they were charged to the observatory, the bill was two dollars. Miss Nannie Harris arrived at Mrs. Emerson's last night. Her arrival was something of a surprise, as she was not expected until Tuesday. 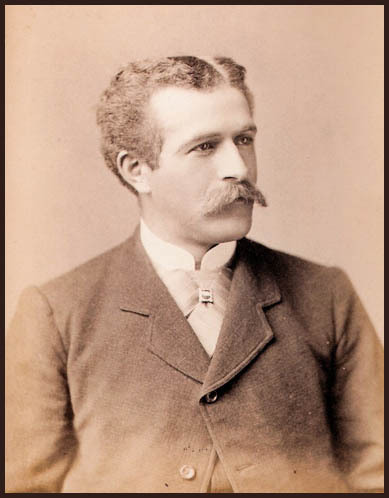 Sunday Apr 15, 1883: Prof. Stone went to Cleveland, Ohio, last night. This morning it was a little cool and cloudy, and for a while looked as if it would be a gloomy day, but before noon it began to break away and became a beautiful afternoon. In the morning I went down to the Presb. Church. Sermon by Mr. Petrie. In the afternoon I took a ramble with Miss Nannie Harris. We went up to the observatory mountain, and spent an hour or two in viewing the scenery, and reading some of Bryant's poems. After supper quite a number of us went into the parlor and sang Sunday songs for a while. Altogether I passed the afternoon and evening very pleasantly. Sunday Apr. 22, 1883: This was a wet and disagreeable day. It rained nearly all the time. This being my day for staying on the mountain, I wrote a letter to Billy Jones, and read a little. Pard and I took dinner with Mrs. Stone and the Prof. In the evening after supper, Miss Nannie played for us, and we sang Sunday School songs. Monday Apr 23, 1883: The rain continued today, and it was tolerably cool, the mercury being down to 42 (degrees). I wrote to Dr. Andrews, inquiring about the tutorship at the Academy. Having had a talk with Prof. Stone on Saturday, I have concluded to quit astronomy when my year is out and return to teaching or something else more in accordance with my tastes. After dinner I spent an hour or two in making flower patterns for Miss Nannie. Afterwards I walked to the post office and mailed my letters. Saturday May 5, 1883: Today it was quite warm, and things grew very rapidly. In the afternoon there was quite a heavy thunder shower, so that I did not get to take my usual evening ride. I put in the afternoon in helping Miss Nannie put down matting on the sitting room floor. After finishing that, having some letters of the Prof's to put into the mail, I had to walk over to the post office before supper. Sunday May 6, 1883 This morning it was clear and bright, and after yesterday's shower everything looked beautiful and fresh, and it continued nice all day, being the finest Sunday we have had for several weeks. Not being my day for going to church I spent the morning in writing to Clara and finished my letter after dinner. As Miss Nannie had an engagement to go walking with McElvee, I didn't "get cheated" out of my ride this evening, but left the hill at five o'clock and went down to town on my wheel. In the evening I had a very pleasant chat, which compensated for being "cheated" out of her company in the afternoon. "Mac" acts as if he was playing a game with me. I am letting him do the playing however, and rather think that he is dealing me the highest cards, and that Miss Nannie's good will is considerably inclined towards my side of the board. She is a lovely character, and I am getting slightly interested in her. Wednesday May 9, 1883: Today was very warm. In fact was hot, the mercury was up to 89 (degrees) at dinner time. Yesterday was also a pretty hot day. Yesterday Baxter Emerson arrived from New York with his wife whom he brought here for her health. Her aunt arrived today. This lady lost her watch, and I found it on the border of one of the flower beds. Today I received a letter from J.H. Phillips of Gallipolis, Ohio, giving me some information as to how to proceed in obtaining a school. Yesterday afternoon I took a walk to the reservoir with Miss Nannie, and read Longfellow to her. I spent this afternoon very pleasantly in helping her with some of her sewing, and in reading to her. Shortly before supper, McElvee and Lyons having come out to the croquet grounds - we were out there under the big apple tree - we all indulged in a game until supper was ready. Thursday May 10, 1883: This was a nice warm day, but was pleasanter than yesterday, as there was a fine breeze going. In the morning I got up pretty early and took a ride out into the country, going about four miles towards Ivy Station, and back. In the evening after dark I rode down to town and mailed a letter to Frank Waters, St. Paul, Minn. In the morning after returning from breakfast I and "Pard" put in the bookcase which I made yesterday. After dinner, Miss Nannie and I took a walk up to the woods, and having found a nice comfortable and shady place, we sat down, while she sewed and I read Hyperion to her. A warm and mutual friendship is evidently springing up between us, and my interest in her is increasing, while I have every reason to believe that her friendship for me is keeping pace with mine for her. Saturday May 12, 1883: Yesterday in the afternoon I took a long ride going out North of town about six miles. In coming back, when about four miles out from town, I broke my left pedal pin and had to walk the rest of the way home except from Charlottesville to the University, where the road was smooth enough to ride with one foot. Though I went over 19 miles during the day, owing to my mishap I rode but 14. I telegraphed to the Pope Mfg. Co. to send me a new pair of pins. Today I had to walk wherever I went, and it was such a lovely day too, it would have been splendid for riding. In the morning before breakfast I walked down to the P.O. and got the mail. In the evening I walked down to town to see if I could get my bolt fixed, but I couldn't. After coming back, McElvee, Miss Nannie and I played croquet until supper was ready. After supper Miss Nannie and I went out on the porch, where we had a pleasant little chat. Ever since her arrival, one month ago today, my interest in her has been growing, until I am now fully persuaded that I love her, and moreover I am equally certain that she loves me, and that too, with the strong and earnest love, such as only the soul of a pure and noble girl like her can feel and manifest. In phrenological development, she fills almost to the letter the description, which Nelson Sizer made for me, seven years ago, of the sort of woman I should choose for a wife. As yet I have not proposed to her, in so many words, but doing so would only be a formality, for she knows that I am in love with her, and I have her word that she entertains the same feeling for me. This may with some propriety, be marked as an eventful day in my life, for I now feel that it is only a question of time when Miss Nannie will be my wife, and a most devoted one, I think she will make. Thursday May 17, 1883: Spent the afternoon with Miss Nannie. While up in the woods we found some wild strawberries ripe, the first of the season. Monday May 21, 1883: In the morning it was cloudy and during the night had rained. It was not raining at breakfast time, so I went down (on) my "bi." In riding down the mountain I lost control of my wheel and got a fall, as far as the fall itself was concerned, it didn't amount to much, as I came down very easily in the bushes at the side of the road, but in attempting to jump I failed to clear the handle bar, and catching my right foot under the bar, and in front of the brake the end of which is worn sharp, got a pretty bad little cut. It cut through my pants, and shoe and made a gash in the skin about an inch and a half long and about a 1/16 of an in. deep. Fortunately the cut was simply a skin wound on the hollow part of the foot just in front of the Achilles tendon. Miss Nannie went to Waynesboro, Va. today, but she will return one week from Friday. My Wheelman for June came today. Wednesday May 23, 1883: For a day or two it has been quite cool and I see from today's paper that there have been heavy storms in the north west. It snowed, on Monday, through Ohio and Indiana. At Siena Ohio the snow was a foot deep. There is apprehension of great damage to growing crops. Miss Ellen received a letter from Miss Nannie today. Her sister was taken sick on the day she arrived, and it will depend on how she gets whether Miss Nannie can come back one week from Friday. She sent me a nice little message, and her love. In the afternoon I took a run out to Ivy Station and a mile beyond. The road was a little rough on acct. of the recent rains, but it was a nice cool afternoon for riding. The cut on my foot is getting along very nicely and gives me no trouble while riding, and pains but very little while walking, and by being careful how I step, it does not hurt then. Saturday May 26, 1883: In the morning it was beautiful and bright for a little while, but it soon became cloudy and at times began to look very much as if it would rain, but it managed to get through the day without doing anything more than sprinkling a little. There was a cool breeze blowing most of the day, but towards evening it was a little close. In the morning I took an early spin to town and a little beyond. I came down earlier today than usual, and Miss Ellen gave me a lunch so that I would not have to wait until dinner was ready. Having eaten my dinner I tightened everything and oiled my bicycle. Strapping on my bundle, I was ready, and mounted at twenty minutes before one o'clock to make a run to Waynesboro. The clouds obscured the sun and there was a cool breeze and everything seemed favorable for a delightful trip. When I was about two miles out it began to rain a little and I feared lest my trip should be nipped in the bud as it were, but my fears were soon brought to an end, for the clouds grew thinner and after a few minutes the slight sprinkling stopped, and a more pleasant afternoon could not well have been hit upon. I pushed along at an easy but steady pace and found no difficulty in making six miles an hour. A few minutes before two I reached Ivy Station about seven miles out. Here I stopped long enough to refresh myself with a cool drink and see that everything about my machine was all right. Meanwhile, quite an eager crowd collected about me and began to ply the usual questions, but I didn't gratify their curiosity long, for I thought of the miles ahead of me, and of the probability that I would have to go slower at the other end, so I mounted and was away like the wind for there was a fine foot path for a ways. A few boys undertook to keep up with me, but they soon found that appearances are deceitful and gave up the chase. From this point the roads began to grow smoother, and I sped along without any incidents worthy of mention until I reached Mecham's river, at half past two. Here I was compelled to make the first dismount since leaving Ivy Station four miles this side. Mecham's river is crossed by a ford, but the ford is by no means an inviting one to attempt crossing on the wheel. It was rough and tolerably deep, and muddy and swift. After casting about for some time for a more inviting way of crossing than wading, I soon found a foot log a short ways above, but I have seen better crossings than it, for I had to go through bushes and climb down rocks and up banks with my wheel, but I succeeded in crossing over dry shod and after a few moments delay in oiling and tightening up I was again on my way rejoicing. Near the station, in front of a wretched little shanty, with "Bar Room" very rudely painted on the door, a great gang of green looking fellows were assembled. Some of them seemed to have been imbibing too freely, and they were all so much taken up with some discussion, or vile story, that they did not observe my coming until I was right among them. As soon as they recovered from their surprise some of them began to fire questions at me, but I had no desire to stop, so moved along answering their questions on the fly, as it were. After riding a mile or two further I passed a beautiful shady grove, where there were a great number of children apparently having a picnic. They were engaged in all sorts of merry games and did not notice me until I was passing. For an instant there was a hush, and then their merry voices rung out in loud hurrahs. It was evidently the first time that many of them had ever seen a man come so near to flying. Some of the more curious started after me. I heard their feet going "pit a pat" along the road way as they vainly attempted to "keep up" and wafted to my ear on the gentle breezes came the anxious appeal of a little voice, "oh mister please come back and let us children see you," but time was precious and I could not stop to gratify them. My wheel whirled noiselessly onward, and I was soon out of sight, and out of the sound of their voices. After riding several miles further on I came to a mill, and a mill pond, here the road strait (sic) ahead was very little worn, so I ventured to follow the smoother one, which turned to the right, but after going out that way for a mile I met a man on horse back, and found that I was on the wrong road, so after talking with him for a short time I faced about and in a few minutes found myself once more at the mill. From here the road was less traveled, and consequently, not so smooth as it was up to that point. It was bumpy and in places rocky, so that I had to pick my way and proceed more slowly, covering not more than four miles an hour and having to dismount quite frequently. Before reaching the foot of the mountain I dismounted twice for water, twice for country horses, and seventeen times for impassable places, besides one "header" which I got in trying to cross a muddy ditch across the road. My wheel stuck in the mud and I went on but picked myself up without any more serious mishap than having a little dust on my clothes. About an hour after my first mistake as to the road I came to another fork and again took the wrong road and went about a mile on that when I began to suspect that it was wrong, for it kept turning back this way instead of approaching the mountains. Just as I was coming to the conclusion to turn back, I met a little darkey, and for a wonder he knew that I was on the wrong road for Waynesboro, and was able to tell me where to find the right one. It is a very rare thing to meet a darkey about here who can tell anything about roads or distances to any place. At about six o'clock I found myself at the base of the mountain, and dismounting began the ascent afoot to its top. I trudged along slowly, and stopped occasionally for a rest, and refreshed myself with the cool sparkling water which flowed freely from several roadside springs. By the road side about half a mile above Afton I came to a beautiful clear spring, whose limpid waters came purling over the rocks down a little ravine. I bathed my face and hands in its cooling waters, and then bearing (sic) my brow to the gentle breezes, I stood there and gazed with delight upon the grand scene below me. The view from here is one of the finest that I have ever seen. Immediately below could be seen the Afton House, surrounded by an inviting grove of native forest, a beautiful road stretched away to the southward, winding, serpent like among the groves, and leading down into the valley. A little above the hotel, coming out of a deep cut, and winding along the side of the mountain is the C + O railroad, the shining rails of which the eye follows along to the right until it suddenly dashes into the tunnel. The valley was diversified with red bare fields, green meadows, and waving grain while here and there were beautiful groves and small mountains, robed in green with groves of pine and of chestnut. Beyond the valley, terrace after terrace of mountains lifted their rugged peaks towards the sky, until they were lost in the hazy distance and the blue mountains below blended with the clouds above. As I stood and looked upon that beautiful scenery a delightful sense of pleasure filled my soul. A glorious feeling of rest took possession of every fiber in my body as I turned from the scene. I felt a renewed vigor, and went on my way rejoicing, feeling repaid for all the miles of the trip, even by that one scene. I soon reached the top of the mountain and though it was rough and rocky, it took me but a short time to reach the bottom, where I found the road smooth and hard and placing my foot on the pedal I glided once more into the saddle, and my faithful wheel bore me rapidly onward towards Waynesboro which I now could see in the distance, and just as the scattering clouds in the west were glowing with tints of gold and scarlet painted upon them by the last rays of the setting sun, I was quietly whirling into the outskirts of the village. Here I met with the most exciting incident of the trip. Just at the edge of the town flows a clear and beautiful stream known as South Fork. This stream is crossed by a ford, and as it was apparently not very deep I attempted to ride across, as the only probable way, that presented itself of getting over dry shod. For a second or two every thing was lovely, and I was beginning to think that I might get over all right, when my "bi" became suddenly inspired with a desire for a drink. At any rate it suddenly lowered its head to the water, but I leaped clear of the handle bar and went on. My jump however was not flealike enough to carry me to the opposite shore so I landed in the cool, clear stream, going in up to my knees, and splashed the water in a manner that gave me a rather sudden bath. Getting myself wet did not matter much. In fact the cool water had a refreshing effect which I rather enjoyed, but what was less of a laughing matter to me at least, was the fact that my bundle of clothes which I had strapped to the head of my "bi" had gotten into the river as well as myself, and was somewhat dampened, but as it was wrapped up in a rubber cloth, I found my things dryer than I had hoped when I came to open it. After getting out of the river and getting some of the water out of my shoes, I mounted once more and soon found myself in front of the Bruce House, where I stopped to inquire where Mr. McCutchin (McCutcheon) lived. Having been directed to the place I arrived just at dark. Miss Nannie had been looking for me all evening, and waited supper for me. I was not very presentable, so soon after coming out of the river, so I related my mishap to her at once, whereupon she showed me to a room, and after getting dressed in dryer clothing, I partook of a nice supper, and soon felt refreshed, after my long ride of 84 miles since dinner. I found Miss Nannie with a bad cold which made her quite hoarse, but notwithstanding that she made herself very agreeable and I passed a delightful evening in talking with her. Sunday May 27, 1883: This was a lovely day. The sun shone out beautifully and the air was cool and refreshing. In the morning I went to the Methodist Church where I heard a pretty good sermon by the pastor. On account of her sister's illness Miss Nannie thought best not to leave her, so she did not go to church. At dinner time Mrs. McCutchin was feeling a little better and came out to dinner. I spent (the) day very pleasantly, and am fully inclined to think that I have more than a friend in Miss Nannie, and my esteem for her is stronger than I have heretofore felt for any one. Monday May 28, 1883: League meet in New York today. Nine hundred bicycles were in the parade. This was a beautiful day, and in the morning Miss Nannie and I went in Mr. McC's carriage out to Baker's Spring. This is the most beautiful spring I ever saw, out from among the rocks at the foot of a little hill a stream of bright and sparkling water came gushing forth, and supplies a nice little lake which is about 50 ft. wide and runs away about two hundred yards where it empties its limpid waters into the river. The water in the lake is about two feet deep and so clear that fish can be seen as they swim about on the bottom, and stir up the sand with their fins. In one part of the lake there are quick sands, and the water courses boiling up in these places throwing up the sand in constant bubbles like a boiling kettle. After spending a short time at the springs we returned to the house, and getting my bicycle out, I bade Miss Nannie, her sister and the children good bye, and mounting was off for the station where I took the eleven o'clock train for Charlottesville, thus ended my first long bicycle trip of the year, and one of the most delightful visits that I have made for many a day. Tuesday June 12, 1883: Received postal card from S.B. Sandis this morning. He sent me notification of three vacancies, and I wrote to two of them. One in Morrisville Mo. Polk, Co. and the other, at Guntersville, Alabama, Marshall Co.
A curious little coincidence in dates. Apr. 12 she came, May 12 the first love talk, tonight one little kiss upon her brow that looked so sweet, as the silvery light of the moon fell upon it, through the grape vines around the porch. Thursday June 14, 1883: This was a lovely day, and the evening was as lovely a moonlight as one often sees. My pard and I brought Miss Ellen and Miss Nannie up to the observatory and showed them the moon through the telescope. They enjoyed it very much, besides it was (a) delightful evening for walking. Since I last wrote the time has passed on pleasantly. I have worked my morning hours, at the observatory, but have remained down at the house in the afternoons and evenings, and have had pleasant times in reading to, talking with, and aiding Miss Nannie in whatever little duties I could be of any use to her. That we mutually love each other there is now no doubt. I know that my feelings toward her have each day been growing stronger, and while I have felt certain that her liking for me has been increasing, she has in words coyly denied that her feeling for me was anything more than mere friendship, but last night as we sat where the moon was modestly peeping through the grape vines around the porch and were talking of our love, I said, in reply to one of her coy little denials - in which though the words were "I don't like you much," the tone of her voice showed that she felt the opposite - "I know that you must love me or you would not allow me to love you and tell you of it so freely, would you?" After a short interval of silence, she replied in earnest tone, "You have me there. There is no use denying it any longer. I do love you." Such a confession from her means a great deal, for, though her Adhesiveness makes it almost impossible for her to hide her feelings from anyone she loves, she has that sweet maidenly reserve which makes her fear to speak all that she feels, lest it might seem fast and unwomanly. In the morning I received a reply from W.C. Godbey of Morrisville Mo. to my application for the chair of Math. in his school. After waiting for ten days he sends back an unfavorable answer. Some men don't seem to know that a business letter ought to be answered on the spot, and he seems to be one of them. Yesterday I dropped a postal to Sandis stating that I had heard from none of his parties, and asked him to send me some more names. A day or two since I received a dozen pictures from Ryder's and sent Sandis one, requesting him to return it when through with it. Sent one to Jake Rehm also. Exchanged with Miss Nannie and Miss Ellen. Received an answer from May this morning. She sent me a right nice letter. Mrs. Holladay, Miss Ellen's sister came yesterday and will spend the summer here. This was a glorious day for touring. It was clear and bright but there was a cool breeze which modified the heat of the sun. I took my usual morning ride before breakfast and at nine o'clock I started out on my wheel with the intention of going to Scottsville, if the road should prove rideable. I rode along at an easy pace and in four hours and a quarter after leaving Mrs. Emerson's I found myself with a ravenous appetite for dinner in front of the Page House, Scottsville. This House set up a pretty good dinner and I did ample justice to it. After dinner I went and made a short call on Miss Nannie's mother and sister, Etta. Miss Etta has been suffering for some time with neuralgia but she was much better today than she had been for some time. I took a short time for riding around town and at four o'clock started for home and got back all right at quarter past eight. Some of the road was abominable, most of it just tolerable, and a mile or two on the Scottsville end as fine as any I ever rode over. I rode the last five miles to S. in 35 min. and did it with more ease than I rode four miles in an hour over the worst part of the way. I am the first bicycler that ever visited Scottsville, and it is not necessary to say that I created more excitement than a first class circus. A drunk fellow saw me riding through town, and ran after me until, when I had dismounted to walk up a steep rough hill, he over took (me) and was bound to have a ride. I listened to his drunken foolishness for a while, and then by a little stratagem managed to get him to let go of me and my wheel long enough for me to mount, when I quickly left him behind. Altogether my trip was a pleasant one, and I gave Miss Nannie a very pleasant surprise by bringing her a note and a ring from Miss Etta, for I did not tell her when I left in the morning that I was intending to go to Scottsville. The farmers are all busy with harvest now so that I did (not) have much trouble with meeting fool country horses. I expect however that I caused one fellow to walk home. He was off of his horse, fastening on a bundle. I gave him warning. He took his horse by the head, but it was no use, horse didn't want to stay, he jerked loose, and the way he made stirrups and bundles sail, was a caution. Sunday June 25, 1883: Today was very hot and the roads are getting fearfully dusty, a little rain would be nice. In the morning I went down to the Presb. Church, but was a little late, the sermon had commenced, but I heard most of it. In the evening Nannie and I went to public hall at the University to hear the address of Dr. Edwards of Lynchburg, before the Y.M.C.A. He gave a splendid address and as we had a front seat we heard him distinctly. Lockwood and Miss Ellen went over too. When we went over, it was cloudy, but we did not think it would rain. We were deceived however, for before the services were half out it began to rain and continued without any indication of letting up. Lockwood succeeded in borrowing a couple of umbrellas and a shawl so that we succeeded in getting the girls home without any serious damage to hats or dresses. Monday June 25, 1883: Received a letter from Clara. The rainy weather which began last night continued all day, and gives its every indication of making a wet commencement of it. In the evening we went over to public hall, to the celebration of the Washington Society. Lockwood, Leavenworth and I walked over and waited outside for the girls who went over in the wagon, it being too muddy and rainy for them to walk. Leavenworth went in with Miss Ellen, Lockwood with Mrs. Emerson and Mrs. Holladay, and I with Nannie. After the exercise it was too wet for much promenading, so after a few minutes I drove home with a part of the company and went back for the rest. Tuesday June 26, 1883: It continued rainy today but was not quite so bad as yesterday. In the evening it quit raining in time to allow the Lawn to be lighted up with Chinese lanterns, and it was a little better for promenading than last night. I took Miss Ellen tonight, and Nannie went with Lockie. But after the exercises were over, we traded partners, and promenaded quite a while after which I drove home with Nannie and Mrs. Holladay and returned for Lockie and Miss Ellen. Wednesday June 27, 1883:	This was a nice cool day and was quite pleasant for the final exercises which I attended in company with Nannie. After the delivery of the diplomas Mr. Reeves of Newport R. I. gave a very interesting address on Wm B. Rogers, a former Prof of Math in Va. University. Saturday June 30, 1883: Today I learned of a vacancy in Winchester Ky. Prof. Thornton's brother told me of the place and I wrote at once, sending my credentials, and mailed the letter this evening. The position is for Principal of school, and the salary for the first year will be seven hundred with increase afterwards if satisfaction is given. I am in hopes that I may be able to get the place. In addition to the credentials I sent, Dr. Harrison sent my name with several others and Prof. Thornton wrote also, so that I have a pretty fair recommendation. Wrote Prof Simon Newcomb asking him to send me a Nautical Almanac. The address for the Ky place is Judge W.M. Beckner, Winchester, Ky. This evening I had a very pleasant talk with Nannie. I love her as I never before have loved a woman, and she earnestly admits that she loves me. I may now hope that she will eventually become my wife. She hesitates in giving me an absolutely positive "yes," only because of her high sense of duty to her mother for whom she has a filial affection that is truly beautiful, and to whom she once made a promise not to marry so long as she wished her to remain at home with her. It will be several years before I will be able, financially, to marry, and there is no reason for not hoping that Nannie's mother will consent to our marriage if we continue to love each other as well as we do now, and desire it. On this day I may say that Nannie and I are, if not absolutely, at least partially engaged. If it be God's will that we should ever be husband and wife may his blessing abide with us, and may He watch between her and me while we are separated from each other. Sunday July 1, 1883: This being my day on the mountain, I did not go to church. Wrote to Miss Emma Struve in reply to her letter of last month. After dinner, the whole crowd of us sat out on the porch and chatted for a while. Later, Nannie and I went out for a walk. We went first to "Ellenwood" Glen, and sat there reading and chatting for some time. When it became cooler we went to the top of Lewis Mountain, and stayed there until sunset. On the way down we picked a hat full of blackberries which we had for supper when we got back. We passed the afternoon very pleasantly. In the evening the whole company of us went into the parlor and sang. Monday July 2, 1883:	This is about the hottest day we have had, the thermometer was up to 88 (degrees). In the morning I took my usual spin to town but, as it was a little late when I started, I went only to the top of Vinegar hill. In the evening before supper I went down town and had my hair cut. It was rather warm riding. After supper I drove down to town with Nannie and Miss Ellen who wished to ride, and had a letter to mail. There is another bicycler in town. He is stopping at Dr. Randolph's, and has been here almost a week, but I have not seen him yet. He rides - I hear - a fifty two in. Harvard and is said to be a pretty good rider. I would like to meet him and have him go on a run out into the country with me. Thursday July 5, 1883: The weather continues to be quite hot, but this afternoon there was a shower which cooled the air a little. Yesterday, Miss Mary Minor came on a visit to Mrs. Emerson's. In the evening before supper I took her and Nannie up to the observatory for a walk. I showed her the telescopes, and she enjoyed the scenery, very much. This afternoon it was our purpose to go over to the Museum, but the rain prevented it. This being the last evening that we would have to spend together, Nannie and I went out after supper and took a walk over towards the University. After returning, we sat out on the front porch and had a pleasant talk together. There in the hallowed stillness of the evening we mutually promised to continue to be lovers, and that, provided we love through the years of our separation, we will marry. I am therefore, on this day conditionally engaged to Nannie. Both of us thought it best to make no absolute vow, but to let it for the time being, remain conditional. Should either of us meet another that we may love better, 'tis not to be kept a secret from the other. If I continue to love Nannie as I love her now, and she loves me with the same womanly devotion which I am now certain she holds for me, there is very good reason for hoping that she will become my wife, as soon as I can be reasonably certain of the means of support. In character Nannie is a rare girl. I have been with her almost every day since her arrival in Apr. and have seen her in all circumstances, from the parlor to the kitchen, and have always found her of a sweet and even temper. She is a true Christian girl, not one of the sort that parates her goodness in words, but one who shows her Christian spirit in all the acts of her daily life. Truly a noble soul rules every action of her life, and I will indeed be a much blessed and fortunate man, if I retain her love and get her for my wife. Friday July 6, 1883: In the morning I stayed down a while after breakfast to talk with Nannie. We went in Kendrick's old room, where they have been quilting for several afternoons, and sewed until it was time for her to get ready to go to town. I could have stayed away from my morning work, and gone with her to the train but I preferred to bid her farewell at the house, where we could be alone, and bid each other farewell, not with the cold "good bye," but with a tender clasp of the hand, a gentle kiss and a loving word. For in saving her, Thou wilt save me the half of my soul. Miss Ellen went with her to make a short visit. She will return Tuesday. Saturday July 7, 1883: Today I received an answer to my application for the Winchester school. They have employed a Principal, so I am disappointed again. Mrs. Emerson received a letter from Miss Ellen. Nannie sent me her love. In the evening I was too lonely without Nannie to stay down at the house long, so I came up to the mountain and wrote her a nice long letter, telling her what news I could think of, and how long and lonely the last two afternoons have seemed without her. Tuesday July 10, 1883: In the morning the clouds began to break and it became a beautiful day. I finished putting in the time I owe the observatory this morning, and now I am ready to seek a new position as soon as I get my things packed up. It is now my purpose to try to get something in Virginia to do the rest of the summer, and continue to look out by correspondence for a position to teach. I intend to put in the rest of this week at reading and fixing up, to spend Sunday in Waynesboro, with Nannie, and to go down the valley the first of the week to Roanoke, and while there I will look out for a situation, for the summer at least. Miss Ellen came home today, she had a pleasant visit, but her ride home on the train gave her a headache. In the evening I took Miss Mary Minor over to the Museum. She was perfectly delighted with it, and went into ecstasies over every pretty piece of rock or mineral she saw. Today I wrote postals to Burt. Warner, Ashland Ky, Billy Trainer, Steubenville, O., and the School Board at College Corner, Ohio, and letters to Beatty Warner, and to Ed. Follett. I also mailed an advertisement to the Commercial Gazette, and one to The Enquirer. Friday July 13, 1883: Got through work at the observatory on Tuesday. Wednesday and Thursday I packed up my things. Today I wrote to May Nabb, Katie Paine, Willie Jones, and Nannie. Last night I wrote to Clara and enclosed a business letter to Will. Visited Monticello this afternoon. As John Jones departed Charlottesville for a summer job in Roanoke, he was happily engaged to the woman he loved. Nannie and John planned to marry as soon as he had a teaching job and could financially support a wife. Before John could return to marry his beloved Miss Nannie, she died on July 7, 1885, and is buried in the Scottsville Baptist Church Cemetery. After her death, John eventually married Katie Crook, a fellow school teacher in Wisconsin. Around 1900, they moved to California, where John became a builder and citrus rancher. The journal and photo of John Jones are part of the Linda Listmann collection. Ms. Listmann transcribed this journal, which was written by her great grandfather; she resides in Santa Cruz, CA.